If you have not yet been, I can only describe Paglugaban Cave as truly amazing! This part of Palawan’s geography and geology is estimated to have formed about 300 million years ago. As such, all of Paglugaban speleothem are very old. In fact, even the cave floor and all of its sediment had taken millions of years to compact and remain undisturbed. Regretfully, not everything has been good. During our last visit a few weeks ago, we discovered many disturbances on the cave floor such as finger marks and depressions as deep as 5cm, obviously from divers pushing off from the bottom. We also found many other marks and tracks indicating divers had settled on the floor for whatever reason. One even drew letters on the floor that if we attempt to erase, may just add more to the disturbance. Hence, these marks are now permanent, or will at least remain visible in our lifetime. We found these and other irregularities such as hazardous line work left inside, and line arrows without any directional purpose. We have since removed these unnecessary incidentals, and the line-work is again safe to use for emergency exits. Despite all the signs of ignorant but unintentional behavior, the cave remains majestic and breath-taking. We believe this should be experienced by all who have the means and training to do so! 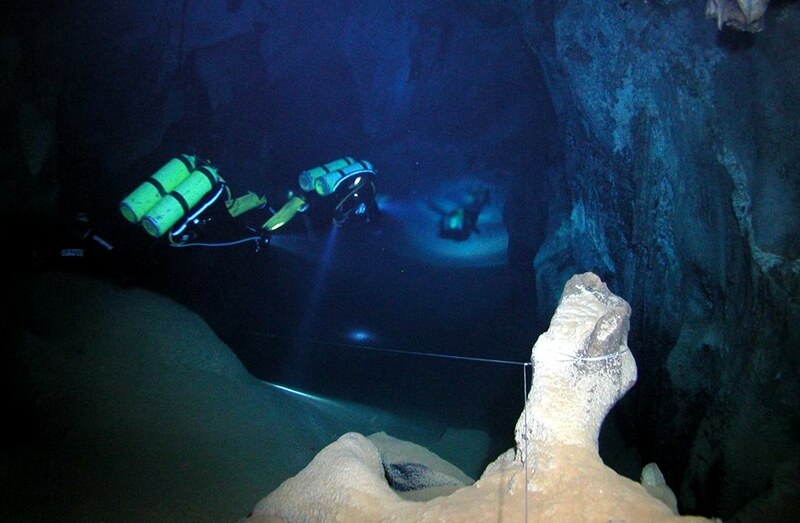 We hope that you will find the time to dive Paglugaban Cave. Through stewardship, education, and information dissemination, you too can share with others the experience, and inspire in them the value in preserving the Paglugaban Cave in its purely natural state.